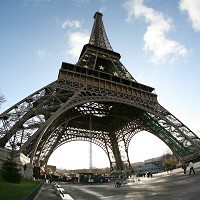 Britons find it easier to recognise foreign landmarks than famous sites in their own country, according to a new poll. It found 100% of respondents could pick out the Eiffel Tower in Paris, while only 77% identified Stonehenge. The travel agent www.sunshine.co.uk also found the Sydney Opera House and the Golden Gate Bridge in San Francisco were more recognisable than the London Eye and Trafalgar Square. Out of the poll of 1,714 people, 98% recognised the Pyramids, while 95% picked out the Great Wall of China. The Statue of Liberty in New York was recognised by 96%. However, Big Ben clocked up just 93%, while the London Eye and Trafalgar Square didn't even make the top 10. Wherever you're going, there's one thing you should be picking out every time - and that's decent travel insurance. Sunshine.co.uk co-founder Chris Clarkson said: "I actually can't quite believe that more UK-based landmarks didn't feature in the top 10 here. To see that more people recognised the Golden Gate Bridge above the likes of the London Eye and Trafalgar Square is a bit of an eye opener."